The Hindu scriptures carry deep hidden meanings to help one become knowledgeable and find a solution to the mystery of life. The Brahma, Vishnu, and Shiva are symbolized as creator, handler and ultimate destroyer. Vishnu is often symbolized as an embodiment of human life and various situation which come to our daily lives. The pictures of Vishnu often present him sleeping on Adi Sesha while riding Garuda as his Vahana. Garuda, a deity himself, is often shown as a winged human-shaped figure with a beak-like nose. Vishnu mount carries Vishnu to Vaikuntha (Heaven), where he lives. His mount Garuda stands for wisdom, thoughts, and incredible speeds. Hence, if anyone wants to control unfulfilled thoughts and balanced their mind, one should worship Lord Vishnu. While some sages and enlightened masters portray, Adi Shesha’s thousand heads hanging over sleeping Vishnu signifies desire, craving, problems, and thoughts which occupy our mind. Despite, various things occupying his mind, Vishnu is calm and at rest. Thus, one must carry calmness as a virtue along with him. Whereas, some other masters signifies the Snake as a symbol of heightened alertness, which is a very important quality to have for someone who would maintain or coordinate anything. Adi Shesha and Garuda were both born enemies. Even in nature, its eminent for a Snake and an Eagle to be rivals. 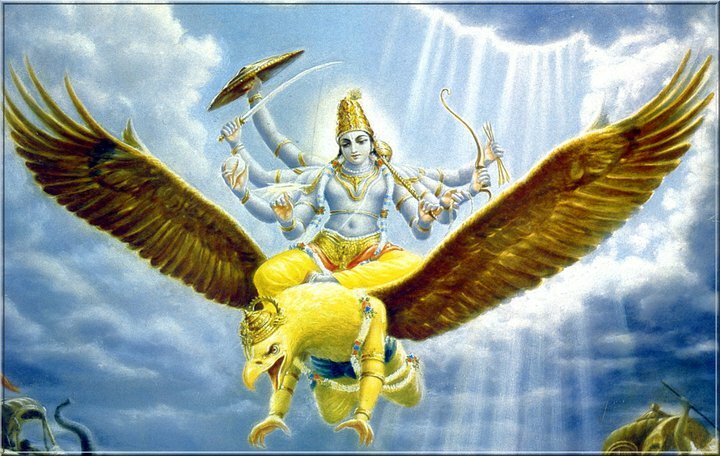 However, Vishnu’s intimacy with both Adi Sesha and Garuda is quite amazing which has deep symbolic meaning with roots. Afore, the symbolic meaning of Vishnu’s intimacy with Adi Sesha and Garuda, let’s know about a brief history. According to the scriptures, Adisesha is the son of Kadru and Kashyap. He is step-brother of Garuda (Vinutha-Kashyap’s son). 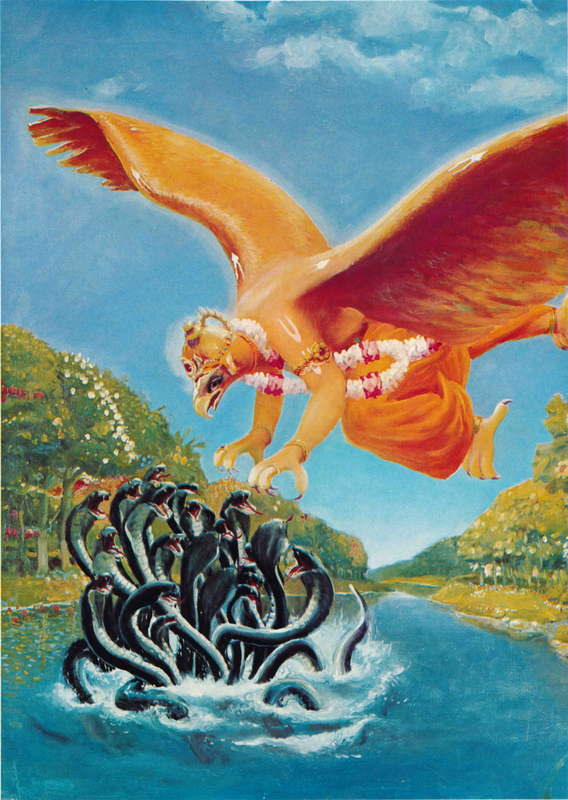 Kadru had given birth to 1000 snakes and Adisesha was the first among the 1000 snakes. Although Kadura and Vinata were sisters from same father and wife of Rishi Kashyapa, they didn’t like each other. Kadura and Vinata, mothers of Adi Sesha and Garuda had a long history of quarrel amongst each other. Their quarrel continued down the line among their children and Garuda eventually became Devourer of Snakes with the struggle to free his mother from the captivity of Kadura and her thousand Snake sons. Thus, it is quite amazing, how Lord Vishnu have managed to be friends with both of them. Here is some symbolic meaning in Vishnu’s companionship with both Garuda and Adi Sesha. Vishnu is a handler and manages the operation of life, smooth operation of the universe itself. In order to create a balance, one needs to go along with both positive and negative aspects. For instance, if anti-matter did not exist matter would not exist because there would be nothing to cancel out the matter and create a remainder called Universe in which we exist. Thus, Vishnu is shown to be with two sworn enemies to signify the balance one needs to have. While Nagas were cruel to Garuda and his mother, Adi Sesha, unlike his brother, would not commit such sin. Truthful and righteous Adi Sesha was granted high position by Brahma and Vishnu because he was with the right. Similarly, it was also true that Garuda was treated badly and his anger against Nagas was true. Thus, Vishnu always supported the righteous and the truth, his companionship with both signifies his never-ending wisdom in truth. Snakes are instinctive and act on instinct, Adi Sesha wasn’t any different in this case. The avatars of Adi Sesha who stayed along with avatar of Vishnu have been portrayed to act on instinct. Balarama who is considered avatar of Sesha used to get angry quick than his brother Krishna and got ready for the fight to protect Krishna in need. Lakshman, who was the brother of Ram and avatar of Sesha Naag, was also very protective of his brother and short tempered. All the snakes having a poor eyesight and the instinctive display of anger portrayed by Adi Sesha displays his short-sightedness. Likewise, Garuda was a half man and half bird have long been associated with far eyesight. Thus, Garuda represents farsightedness in Vishnu. The Vishnu’s companionship with both of them signifies one must be able to act quickly in short periods and have a plan for future.